Learn about San Diego, California by reading San Diego - Great for Vacation, Mi Amigo by Charlie Spence, Aviation Writer. It features a mini, but thorough tour of the destination, plus all you'll need to know to plan your trip including getting there, objective information on places to stay and eat, and things to do. At the end of the article, we've provided a summary of the contact information for your easy reference. Enjoy! When you arrive in the San Diego area your first big decision must be selecting in which direction to start, because anywhere you turn there is beauty, excitement, history, fine and exotic dining, entertainment, leisure sports, beaches and just about everything to make your visit memorable. The city area of San Diego offers a variety of places and activities to please even the most difficult-to-satisfy tourist. But that is just the beginning. San Diego North has an amazing coastline, mountains, deserts, historic missions, golf, spas, arts, and, well you get the idea. Let's begin in the city. Visit Old Town where life as it was in the 1821 to 1872 period is recreated. San Diego became California's first Spanish settlement in 1769 when a mission and fort were established. This historic park has five original adobe buildings, which include shops and restaurants. There is a schoolhouse, blacksmith's shop, the city's first newspaper office, and stables with a carriage collection. Two historic spots to include in your visit are La Casa de Estudillo, which is a mansion built around a beautiful courtyard, and La Casa de Machado y Stewart. This latter place is filled with artifacts that reflect life in that era. An old non-descript office building in Old Town has been converted into 'Bazaar del Mundo Shops.' It features accessories for the home, fashions, arts, and collectables. This and Casa Guadalajara restaurant at the corner of Juan and Taylor Streets welcome you at the entry to this unique old town community. Balboa Park, just minutes away from downtown San Diego, is a huge 1,200-acre expanse acclaimed for its horticultural treasures. Here you will enjoy a host of beautiful gardens, 58 varieties of palm trees, and a botanical building that has more than 2,000 tropical plants. 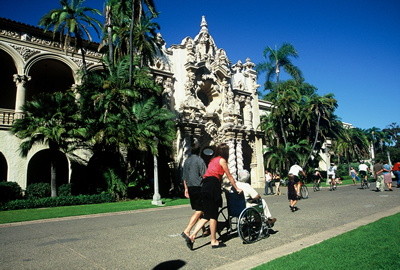 Begin your visit to Balboa Park at the visitors' center to get your bearings as to which of the many areas you want to enjoy first. Along the Park's El Prado walkway magnificent Spanish colonial buildings house many of the museums. (They were built originally for the 1915-1916 Panama-California Exposition.) The Park is also home for San Diego's world famous zoo where colorful and exotic species are discovered in their natural habitats. As much as you will enjoy the many places in the city of San Diego you must tear yourself away. The beauty and excitement of San Diego North awaits. If you are a golf fan, you no doubt have watched the televised tournaments played at Torrey Pines course and secretly wished to personally see the magnificent area. Located in La Jolla, this golf course is but a short distance from Torrey Pines State Park Reserve and Beach. Here you will enjoy walking areas, a family beach, and fabulous ocean views. 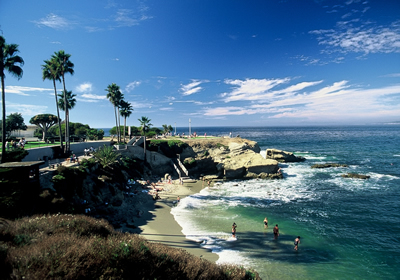 At the village of La Jolla, you will find shopping and dining just a few steps from the ocean. One of my favorite stops has been dinner at the Marine Room, serving excellent cuisine in a room with tall glass wall to provide a delightful view of the cove. Ocean waves lap below the windows making you instinctively want to lift your feet if your table is next to the glass. It is one of the area's most expensive restaurants but arrive there for a table at sunset and the view is magnificent, which compliments the food, and it's worth the price. La Jolla is just one of the several unique spots along highway 101. A few miles north, enjoy shopping at the elegant boutiques at the Del Mar Plaza. This is on a hill where you can relax with a drink and take in the scenic ocean view. A bit father north, in Oceanside, take time to tour the Mission San Luis Rey. The Spanish, as you know, established missions in California a days ride apart. San Luis Rey is a 204-year-old landmark known as the 'King of Missions.' It is the largest working mission in California and is a remnant of life of the Padres and Indians who lived in the mission well over a century ago. Other missions in the area worth visiting are Mission San Antonio de Pala, which is the last of the missions still serving Native Americans, and Santa Ysabel Mission. The latter, located on the way to Julian, has a museum, murals, and an Indian burial ground. In the valley section, travel over to Escondito, a city that blends small-town friendliness with big city action. The area around Escondito includes San Diego Zoo's Wild Animal Park, San Pasqual Battlefield Museum, and Welk Resort. At Escondito you have another decision to make: go northwest to Vista and to the Gas and Steam Engine Museum, or travel 12 miles northeast to Bates Nut farm. The museum at Vista has 40 acres of early farm life in Southern California. You'll see hand weaving, blacksmithing, farm kitchen, gas and steam engines, and tractors. At the Bates farm, start out feeding the animals before heading for the Bates store. There select from a tempting array of nuts, dried fruits, homemade fudges, and gourmet foods. Be forewarned, the gift store has more than 5,000 square feet of enticing items of gifts, home d'cor, and collectables. What the heck, this is a vacation so don't choose. Let's take in both attractions. The desert and mountains also beckon. Just two hours from downtown San Diego, the desert welcomes you for golf, hiking, biking, or just doing nothing but relaxing. In the mountain area you will find Santa Ysabel Mission, mentioned earlier, and the Palomar Observatory. In this area of Southern California you can pick any area, stay there and enjoy it, or travel to any number of enticing attractions. Whichever you choose, one thing is sure after you leave - you will have had a great time and want to return. Although closest to downtown, this is airline base. Because this is such a popular vacation area there are many and varied places to stay. You will find everything from quaint bed-and-breakfast inns to luxurious resorts or vacation rentals. (Some of the resorts also have casinos.) Prices for some of the accommodations start below $100 a night and go up to what you want to pay. Prices vary with seasons, amenities, and views. It is best to determine what area you want as your base and then pick your accommodations. You can check rates and book your room and rental car at IFA's Online Travel Booking Service, travelservices/travelservices.htm. Notice: This information is current as of February 2006. It is recommended that you contact the numbers, and/or visit the websites above to determine any changes to the information.